George W. Bush is the 43rd President of the United States of America. He was sworn in to office in January 2001 and re-elected November 2004 and sworn in for a second term in January 2005. Bush is also a former Governor of the State of Texas. President Bush was born July 6, 1946, in New Haven, Connecticut, to Barbara and future U.S. President George H.W. Bush. In 1948, the family moved to Midland, Texas. Bush attended three of America’s most exclusive educational institutions including Philips Andover Academy and Yale University from which he received a bachelor’s degree in history in 1968, graduating in the top 85% of his class. He then served as a second Lieutenant in the Texas Air National Guard and was discharged in 1973. Two years later he attained a Master of Business Administration from Harvard Business School. Following graduation, Bush moved back to Midland and began a career in the energy business working as a Director in the Harken Energy Corporation. After working on his father’s successful 1988 Presidential campaign, President Bush assembled a group of partners that purchased the Texas Rangers baseball franchise in 1989 of which he was named General Manager. His role earned him the reputation of a successful business man. In 1994 Bush won his campaign with 53% of the vote and was elected the 46th Governor of Texas after defeating Democratic candidate Ann Richards. As governor, Bush increased state spending on elementary and secondary education and made the salaries and promotions of teachers and administrators contingent on their students’ performance on standardized tests. His administration increased the number of crimes for which juveniles could be sentenced to adult prisons following custody in juvenile detention and lowered to fourteen the age at which children could be tried as adults. Throughout his tenure Bush received international attention for the brisk use of capital punishment in Texas relative to other states. In November 1998 he became the first Governor elected to consecutive four-year terms. In 2000 Bush was elected to President. During his tenure Bush worked to extend freedom, opportunity, and security at home and abroad. His first initiative as President was the No Child Left Behind Act, which was aimed at raising standards in schools, insisting on accountability in return for federal dollars, and led to measurable gains in achievement – especially among minority students. Faced with a recession when he took office, President Bush cut taxes for every federal income taxpayer, which helped set off an unprecedented 52 straight months of job creation. And President Bush modernized Medicare by adding a prescription drug benefit, a reform that provided access to needed medicine for 40 million seniors and other beneficiaries. On September 11, 2001 Islamic terrorists caused the death of approximately 3,000 people in the country which led President Bush to respond with a comprehensive protective strategy. He led the most dramatic reorganization of the federal government, reforming the intelligence community and establishing new institutions like the Department of Homeland Security. He built global coalitions to remove violent regimes in Afghanistan and Iraq that threatened America in 2003; Bush’s public-approval ratings were the highest of his presidency, reaching 90 percent in some polls. In January 2002 without an order from the Foreign Intelligence Surveillance Court Bush authorized the National Security Agency (NSA) to monitor the international telephone calls and e-mail messages of American citizens and others in the United States. This led to controversy in December 2005 as persons found out their privacies were violated. Bush administration announced that they were within their right as the September 2001 joint Congressional resolution authorized the president to use “all necessary and appropriate force” against those responsible for the September 11 attacks. Legislation granting immunity to the related telecommunications companies and expanding the NSA’s surveillance powers was passed by Congress and signed by Bush in July 2008. 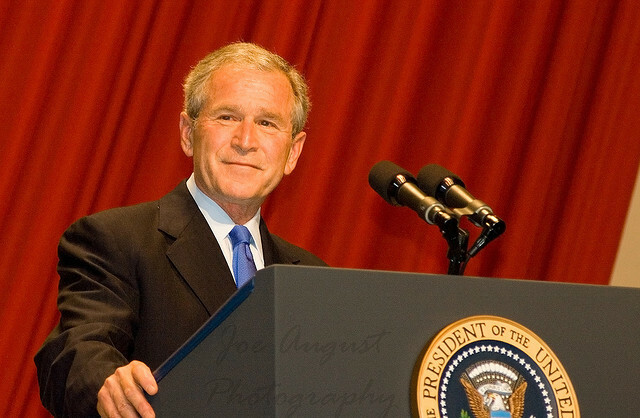 Bush received heavy criticism for his handling of the Iraq War as reports of abusive treatment of prisoners American soldiers at the Abu Ghraib prison in Iraq surfaced along with reports of unjustified and inhuman detentions of prisoners in the Guantanamo Bay prison. These reports coupled with the invasion that did not turn up any substantial evidence of Iraq mass terrorist intentions, caused the Bush administration to come under much scrutiny.